The ONC is a well studied region with a literature age of around 1Myr. This cluster was selected as a fiducial cluster in Mayne et al (2007), where an age of 1Myr is assumed. This cluster shows a clear example of an R-C gap, a break in the CMD between the convective PMS and the radiative MS stars. This can be seen in the above CMD. 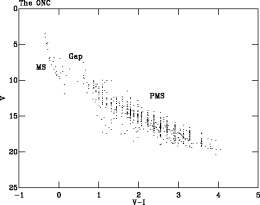 The photometry used in Mayne et al (2007) is from Hillenbrand (1997). The entire photometric catalogue of Hillenbrand (1997) was used to generate an empirical isochrone.